This ski season Salomon seems to be putting their gear on a bit of a diet. The Salomon Quest Max 120 Boots we reviewed last year trimmed the fat by nearly 20% and have been released this year as the Salomon Quest Max 120 BC Boots. 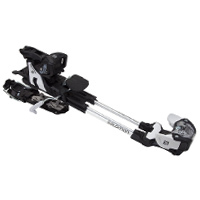 Similarly the Salomon Guardian WTR 16 Bindings we were riding last season have lost a little in the weight and price department, 40 grams and 35 dollars respectively. 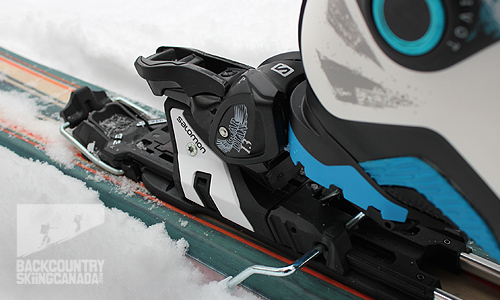 These new alpine touring bindings are called the Salomon Guardian WTR 13 AT Bindings and although they don’t have as high of a DIN setting they still retain all of their strength, vigour and power. Their lower DIN range of 5 - 13 is for those of us in the lower weight category who prefer to keep our skis on the snow most of the time. If you think about it who really needs a DIN that goes all the way up to 16 anyways? Maybe those in the 250 pound plus range or hucksters who think a higher DIN is equated with superior skiing talent? Being in the lean ski touring weight range of about 175lb and owning two knees that have put their best bump runs and cliff hucks behind them, my DIN is set to a paltry 7.5 on the best of days. I would rather release early and get a face shot from the ground then stay onboard my planks and have that unwanted energy take out its vengeance on any part of my knees. That’s just me though and plenty of people out there need big numbers in their binding windows in order to send it big or just shred hard. This is where the little brother to the Salomon Guardian WTR 16 AT Binding comes in, the new 2013/14 Salomon Guardian WTR 13 AT Bindings. 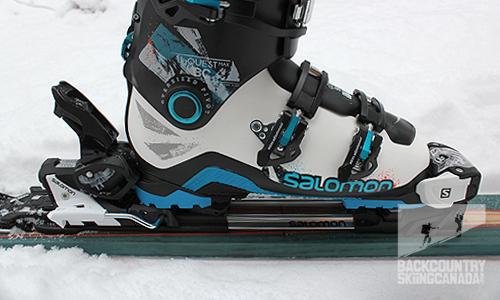 The Salomon Guardian WTR 13 AT Bindings naked and with the new Salomon Quest Max 120 BC Boots. 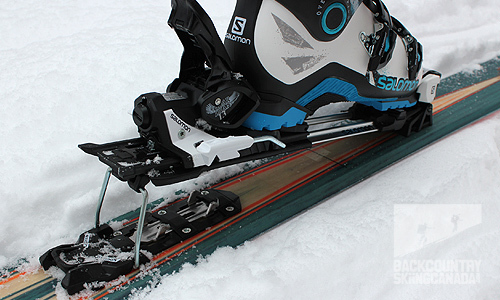 As I mentioned in the opening paragraph The Salomon Guardian WTR 13 AT Bindings offer a discount in price as well as a lower maximum DIN of 13 but otherwise they share the exact same feature set of the Guardian 16. Review done! Just kidding. 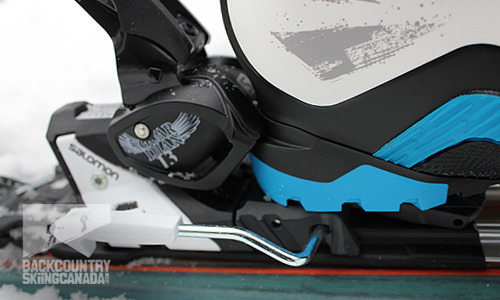 Lets go over a few of the key features of the Salomon Guardian WTR 13 AT Bindings and if you want to be even more informed give a quick read of the Salomon Guardian WTR 16 AT Bindings or watch the video. At 80mm the Guardian 13 has an Oversized Platform which provides good power transmission and responsiveness so you can get today’s fat ski from edge to edge more quickly. The Guardian 13 has a Low Profile Chassis of just 26mm for the maximum stand height. This provides greater stability and improved feedback from skier to snow. Having to remove your skis to switch from tour mode to ski mode is not the ideal situation. 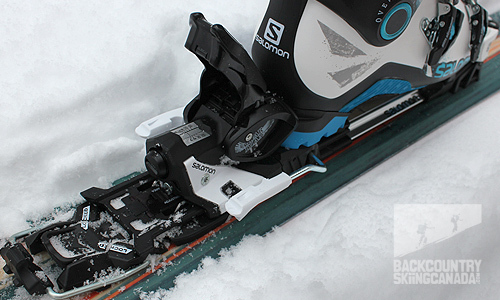 Luckily Salomon’s new Guardian WTR 13 AT Bindings make it easy to switch between modes. The lock and riser mechanisms are located behind the heel piece of the Guardian 13 (as with the 16) so you can easily unlock your heel with the end of your pole and flip the riser over 180 degrees. Now you are ready for walking (once you put your skins on). Should the up track get too steep then flick the riser back 90 degrees with the end of your pole and you get the 2nd, higher walk position. To revert back to ski mode you simply flick the riser back the final 90 degrees slam down your heel and you’re ready to shred. Touring mode offers two height adjustment options. The first is the low position which does not provide much elevation and the second is the high position for when the skin track gets steep. 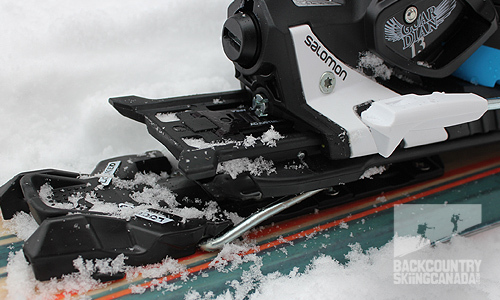 The metal base place provides a solid contact point and eliminates the build up of snow underfoot that can plague other alpine touring bindings. - Automatic wing adjustment on the toe piece. - Hike and ride switch easily engaged with your ski pole. 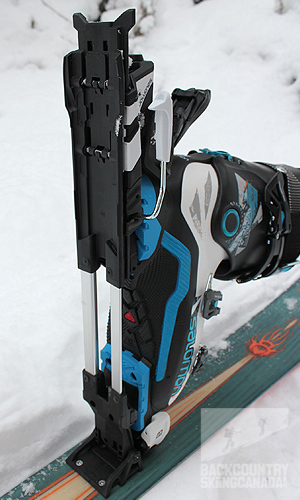 No need to remove skis to switch between modes. 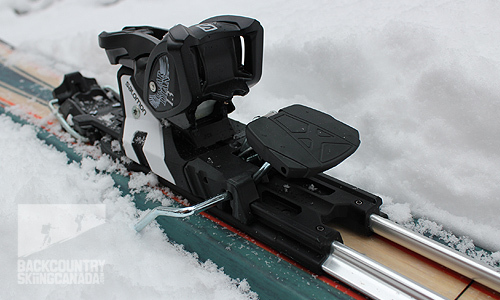 - Din 5-13 accommodates most skiers’ levels and weight. 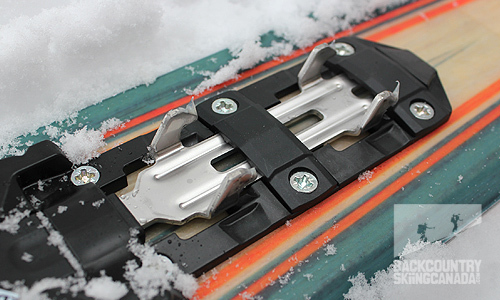 - Simplified base plate—reduced snow build up underfoot during climbing mode. Lets start with looking at the toe piece. Take note, they are compatible with ISO 9523 certified AT and alpine boot soles and not compatible with non-certified, full-rubber AT soles. And now the heel piece. With the heel locked in place. There is a full ninety degrees range of motion on the toe pivot for those über steep skin tracks. 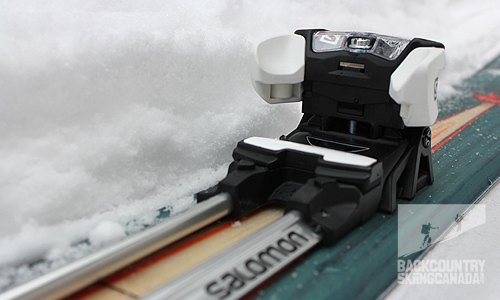 Having a second lighter Guardian binding option (albeit not that much lighter) is perfect for those of us who felt the 7-16 DIN rating of the Salomon Guardian WTR 16 was a little overkill. 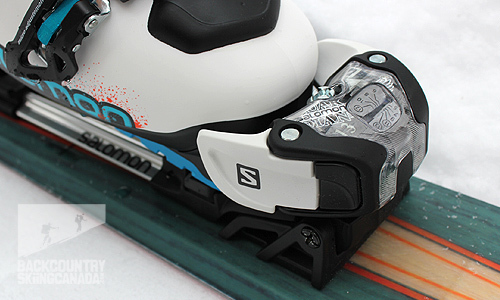 The new 5-13 DIN rating of the Salomon Guardian WTR 13 AT Bindings (hence the name) is suited to younger and lighter skiers who like myself just don’t need all that beef found in the Guardian 16 model. 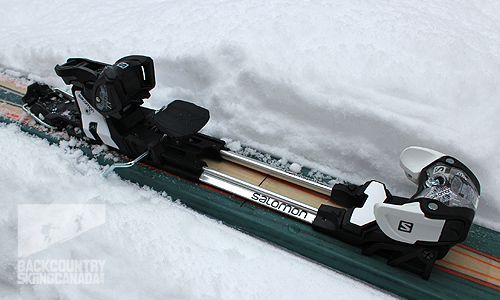 All of the same great features on the Guardian 16 made their way into the Guardian 13 including the 80mm wide platform and 26mm stand height, which make driving today’s wider skis a little easier. 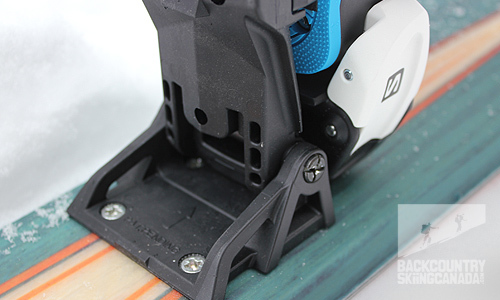 The location of the heel release and riser are still easy to get to which facilitates quick and painless switch overs from tour to ski mode. I only have a few real gripes with the new Guardian 13 bindings. The first is that there are only two riser heights (as with the Guardian 16) and it would be nice to have a third option. Second, the Salomon Guardian WTR 13 AT Bindings only accept AT boots and alpine boot soles which are ISO 9523 certified—basically a downhill boot. I have tried using boots which I’ve reviewed from Dalbello, Dynafit, La Sportiva and Scarpa to no avail. They did however work seasmlessly with my Black Diamond Prime AT boots. The Salomon Guardian WTR 13 AT Bindings are perfect for those who ski the resort but still like to ski tour occasionally or those who like to ski hard, fast and aggressive, regardless of whether they are in bounds or out, but who don’t require the holding power of the 16 DIN binding.